Environmental organizations often mistakenly frame nature as separate to people. This campaign avoids that mistake, but does it work? The main mistake environmental organizations have made is talking about the environment as something separate to us — something that exists around us. It’s a mistake because we are a part of nature. We eat the food, breathe the air, and drink the water that nature provides us. The “environment” frame is so entrenched that if you asked a hundred people on the street in most western cities, “How would do describe the environment?” you would be likely hear words like: the sea, trees, mountains, forests, and rivers. When organizations talk about “saving the environment” they are reinforcing the idea that the environment is separate to us. It’s the wrong frame. A new campaign by Conservation International is trying to avoid this mistake. “Nature Is Speaking” is an attempt to show that nature and people are inseparable. We are reliant on nature and part of it. 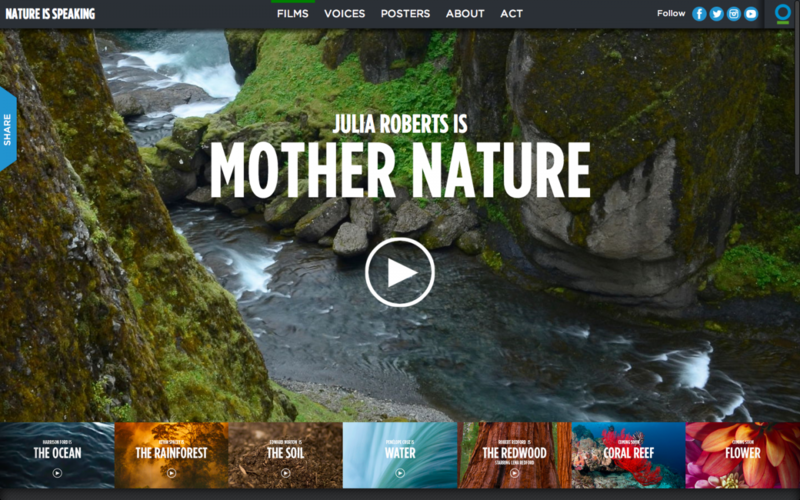 The campaign is voiced by Hollywood A-Listers all playing their own roles: Mother Nature, The Ocean, The Rainforest, The Soil, The Water, The Redwood, The Flower, The Coral Reef. The campaign is a step in the right direction and something other organizations should take note of. The photography is stunning — it shows how magnificent the natural world is and whats at stake. The ads, in sum, do make the case that nature is critical to our survival. I’m not sure that the campaign will meet the objective of, “turning the conversation around and making the movement relevant to entirely new audiences.” It’s a bold campaign that may rub some people up the wrong way. If by new audiences, Conservation International means conservatives, a message from an environmental organization delivered by “Hollywood liberals” may not hit home. The messenger may be a problem. There are two videos still to be released and the narrative arc of the series seems to bend towards something more positive. “The Water” and “The Redwood” are more empowering messages than the others (they offer choices). But how many people are going to see every ad? My final criticism is more fundamental. There are no people in the ads. If the purpose of the campaign is to show the connection between people and nature, I’d argue that it’s necessary to show people and nature together. The campaign may not work, but at least it’s the right frame.